The best side to this DVD is the stylish cover art by Mark Wilkinson. Maybe many a listener's expectations were high as this contains Misplaced Childhood completely. It is an important album also in my prog history, one of the first actually, and it still fascinates me - for reasons of nostalgia? But I wasn't excited by this live running of it. Maybe Frank Usher's guitar style doesn't fit into it as Patykk says. But to me listening to a studio album with my own images and associations is very often more pleasing experience than watching the concert from a TV screen, especially if the show isn't visually something special and if the direction is not up to my taste. Here it is somehow tiring to watch. Fish is very much in a close shot, and I know more beautiful things to see than him! The rest of the show includes nine Fish solo tracks (badly chosen IMHO) and 'Incommunicado', 'Market Square Heroes' and 'Fugazi'. 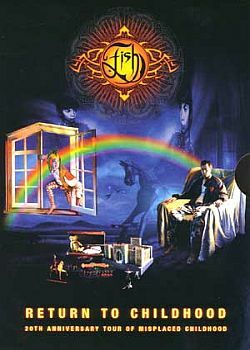 The next time I have a chance to borrow a live album or DVD by Fish I may not bother at all. Oh, one more thing. The interview is an hour long, shot in a street cafe probably, without a single change in the view (escept the river traffic on the background). You can't really hear the words of the interviewer at all, and Fish repeats 'you know' in every half minute. So I can say it must be the most tiresome interview I've seen.